“Are There Dirt Bikes in Heaven?” from Christian Faith Publishing author Tami Lawrence is a charming and thought-provoking book told from the point of view of a young child asking his mother many innocent questions about heaven—what will he find there when he leaves this life?—and the wise, compassionate way his mother answers him to the best of her ability, guided by what the Bible says about the matter. “Are There Dirt Bikes in Heaven?”: a touching story in rhyme presenting a young child’s questions about heaven. 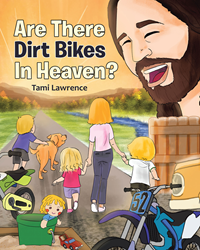 “Are There Dirt Bikes in Heaven?” is the creation of published author Tami Lawrence, an experienced educator and writer with a specialty in early childhood education, and a loving wife and mother of three young children, whose conversations with them inspired the concept for this book. “I think being a kid is so cool. There are so many fun things that I get to do. I really love my family and friends and God too. I was thinking about heaven, and so I asked my Mom if she could explain a few things. And then I asked, ‘I was wondering what heaven will really be like? Will I get to play with my toys and ride my bike? Are there dirt bikes in heaven?’ I wanted to know. ‘Can you run in the grass and play in the snow? Are there puppies and kitties and other animals there too? Do they run around free or live in a zoo? Are there houses with furniture and cars on the street? Do you have to wear clothes and shoes on your feet? Published by Christian Faith Publishing, Tami Lawrence’s new book is a beautiful reminder for parents to not shy away from their children’s difficult questions, using the wise mother’s response in the story as an example. Based on the author’s conviction that the early childhood years are the prime time for developing faith and belief in God, Lawrence’s book is an invaluable starting point for parents and children to talk fruitfully and candidly with each other about the big questions on God, faith, and the afterlife. View a synopsis of “Are There Dirt Bikes in Heaven?” on YouTube. Consumers can purchase “Are There Dirt Bikes in Heaven?” at traditional brick & mortar bookstores, or online at Amazon.com, Apple iTunes store, or Barnes and Noble. For additional information or inquiries about “Are There Dirt Bikes in Heaven?”, contact the Christian Faith Publishing media department at 866-554-0919.